"A genuinely mouthwatering dish with an Asian kick that will knock your chopsticks off! 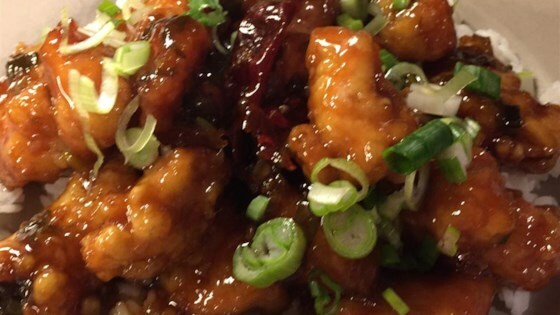 Don't be fooled by other General Tsao impostors: this is simply the best Chinese chicken you will ever have. With a flair of peanut oil, a streak of sesame, a dash of orange, and a sweet spot for hot, this is sure to be a favorite. Just don't forget to deep-fry twice! Serve with steamed broccoli and white rice." Mouthwatering fried chicken in a slightly sweet and spicy sauce.